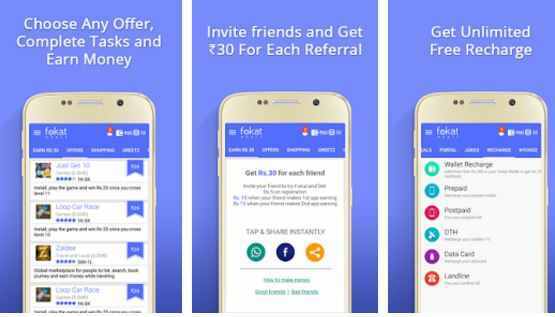 Hai guys,today we are going to present a new free recharge app called Fokat money app which gives you free money by doing simple tasks like downloading apps,playing contests,refering friends etc. The main feature of this app is that it gives you 10rs as joining bonus. You can also Refer your friends to earn upto Rs 30 per referral. So lets see How to Earn Free Recharge from Fokat Money App. 2. Now install and open the app swipe through the intros then Click ‘Play’. 3. Then Click ‘Done’. Enter your mobile number and Verify it. 5. Now from offers tab download apps to earn some extra cash. 1. First of all Click On Earn Rs 30 tab located near the offer tab. and share it via various platforms like whatsapp,facebook etc. * Rs 15 when your friend download his second app. Your earning can be reedemed through prepaid, postpaid, DTH, Data Card and even Landline recharge. So guys start earning free recharges with fokat app.